Get your students making music the first day they play! The very first time I picked up a recorder, I fell deeply in love with this sweet instrument. I grew up as a clarinetist, but developed jaw problems and had to quit woodwinds forever – or so I thought. Then, I began my Orff Schulwerk journey and found the recorder, and the rest is history. 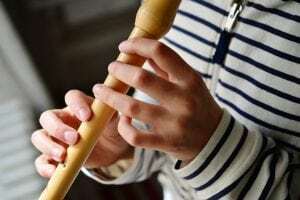 I found that the recorder was a tool of great pedagogical power, a tool that could teach my students how to improvise, read, and compose a melody. There are many different methods of beginning a student’s journey on the recorder. One can begin on A and high C, B-A-G, or even E-D-C. In truth, a students’ journey must begin far before they even touch a recorder. Before they pick up their instrument for the first time, their mind, hands, fingers, tongue, and air support need to be in place. My students first experience the recorder on the very first day of kindergarten music. As they walk in, awed by my shelves bursting with instruments, they follow me while I play my recorder. I match the tempo of their feet, and then suddenly I stop playing and freeze. This generally causes my students to also stop. I resume playing, and stop again. As the kindergarteners realize that we are now playing a “game,” they begin to giggle. Once my students can stop with me, I change my sound. By creating jumping sounds or playing “in slow motion,” I not only expose my students to the entire range of recorder sounds, but also teach students how to respond physically and expressively to musical cues. From the very first day, the recorder is a source of positive musical experiences. One of the biggest hurdles when learning any new skill is the motivation of the student. If a student wants to learn, then they will persevere through any difficulties they may have. If the recorder already has a positive place in their heart, then they will put forth the effort to persevere through the beginning squeaks and finger leaks. The recorder, along with many instruments in the general music classroom, students need to have the ability to use both their dominant and non-dominant hands. In other areas of school life, this is not the case. A student’s non-dominant hand is often ignored throughout the rest school day, with the exception of physical education and typing classes. Luckily, music is a subject where this lack can be remedied. Making sure students learn hand clapping games and play instruments that use both hands equally (rhythm sticks, tubanos, maracas, barred instruments, just to name a few) will help them build capacity in their non-dominant hand. Music: “Rakes of Mallow,” from Rhythmically Moving 2. Opening position: Closed circle. Students have a scarf in their left hand, right hand is behind their back. Students circle to the left for 16 beats while bouncing their scarf with their left hand. Students circle to the right for 16 beats while continuing to bounce their scarf with their left hand. With their left hand, students throw the scarf in the air and catch it three times. On the fourth measure, have students turn alone. This section is performed twice. Once students have mastered the basic dance, the next step is to allow students to create their own B section where they explore what other artful actions they can do with only their left hand moving. As much as nondominant hands are ignored in daily life, fingers and finger dexterity are even further ignored. As my teaching career has progressed, I have seen first-hand the effects of students raised with video games and tablets: students are falling behind in gross motor skills, fine motor skills, and general muscle tone. About six years ago, I began to notice a significant decline in my students’ ability to actually place their finger over the hole on the recorder. I soon realized the issue was not focus or inattention, but a simple lack of muscle development. My students had never been asked to independently move their ring finger in their whole life. I spoke with my school’s occupational therapist about what exercises I could do with my students to help develop those finger muscles. She suggested playing with PlayDough or digging in sand/dirt as probably the most practical solutions. Unfortunately, my carpeted music room was not the best space for those activities, so I created my own finger dexterity exercises based on the following hand-shapes. After the shapes were named by my students, we used them in steady-beat listening exercises. I would call out two animals, and students would alternate between making those two shapes with both hands. As students progressed, we would try patterns of three animals, or have student leaders. Another finger-related intervention I have tried is the “headless” recorder. My school purchases recorders for my third graders, that they use until they leave us until fifth grade. My fifth graders choose to donate it back to the school or take it with them. I have a class set of recorders where I have removed the head joint. This way, students can look down inside the recorder and see if their fingers are fully covering the holes. Students have the opportunity to become familiar with the layout of the recorder and also do not have a way of producing sound. To help my students be prepared for articulating notes on the recorder, I began using beat-function syllables. A beat-function system using t’s or d’s to articulate notes transfers extremely well to articulating notes. Starting about two weeks before they get their recorders, I have students read rhythms with their hand in front of their mouths. This way, they can feel the way that the air is separated when d’s and t’s are articulated. Because articulation is not visible to students, it can be a difficult concept for them to understand. Airflow is critical to producing the sweet sound of the recorder, and producing gentle air is another difficult concept to master. I pair practicing articulation with practicing gentle air. I used to use tissues for this activity, but last year I experimented with using craft feathers (purchasable at any craft store for less than two cents per student)with great success. This lesson occurs about one to two weeks before they receive their recorders. I directed students to hold the feather about an inch from their lips. After opening their lips a tiny bit, students practiced reading rhythms and watched their feather move with their articulations. Then I had students use only a tiny amount of air, to see if they could read rhythms and have the feather only move a tiny amount. At the end of class, students took the feathers home as homework for music class. After students have been prepared, it is finally time to begin to actually play the recorder! Again, there are many choices for the music teacher. I strongly recommend trying any recorder before buying a classroom set. I prefer to use recorders that are white or ivory colored. With those recorders, a teacher can spot an improperly covered hole from across the room. There are also a few choices about what pitches students should learn first. 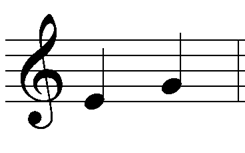 Once E-G is mastered, it is simple to add the notes B and A. It can be difficult to judge whether a student is overblowing or if a student has an improperly covered hole. The class before the students get the recorders is when I allow them to discover with the headless recorders and teach them about “feather breaths.” When we actually get recorders, our only focus is to produce a low E.
Materials: Labeled recorders for each student, tenor recorder for teacher, bead necklaces. Using my tenor recorder, I demonstrate left hand on top with “chicken fingers.” (The thumb hole and first hole are covered.) All students hold their recorder high in the air with the “chicken fingers” displayed until the entire class has their left hand on top. Nonverbally, I have the class use simultaneous imitation – they do exactly what I do, when I do it. I demonstrate feather air and then together we play the first note – a B. 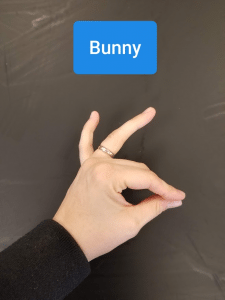 If the class is successful, I add one more finger for “bunny fingers” and we play an A. I model moving from A to B, and they simultaneously imitate me. 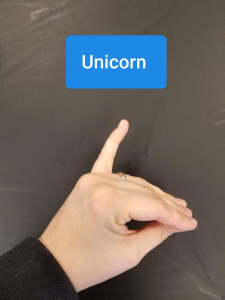 Before moving to “unicorn fingers,” I have my students take their recorder out of their mouths, turn it horizontally (with bunny fingers still in place) and watch their ring finger cover the hole. We do this ten times before we return to our nonverbal simultaneous imitation. I model moving from “bunny” to “unicorn” – A to G. Once the G is in unison and student fingers are in the correct place, I have students stop and pretend to “spray glue” their left hands so that they cannot move. Next, I demonstrate adding the next two fingers on the right hand, so that students are playing an E. We play E-G patterns as we listen. Once the class has their fingers in low-E position, I have students stand in a circle. I walk around and listen to each student individually, as all students practice. If students can play the E successfully, I put a bead “necklace of knowledge” on them and challenge them to add one more finger to play a low D. If everybody earns a “necklace of knowledge,” we stop and have a class celebration. At the end of class, students return their necklaces, put their recorders back in their bags and then return them to the class bin. Even with all of the above preparation, students still squeak, and that is okay! If my students are squeaking, or playing the upper octaves, I check 3 things – finger placement, thumb placement, and have them blow slower. If they are still have problems, I take their recorder, turn their mouthpiece backwards and have them blow while I cover the holes. If the sound is good, then it is a finger issue. If not, it is easier for them to fix their air support when they don’t have to worry about finger placement. If you have a student that has limb differences, I strongly encourage you to check out the website Another Way to Play, or check out the article “Adaptive Solutions: Recorder Instruction for Students With Physical Differences” by Valerie Thomforde in The Orff Echo (Vol. 51, No. 1). I’ve had students with different abilities use alternative fingerings or adaptive recorders if needed. The important part is to be open with your student and their family, and make adaptations before recorders are handed out. Once students know their first two notes, they will soon be on their way to improvising, creating, and composing on their own! If you are looking for more information on how to integrate recorder with your classes, try visiting your local Orff chapter, taking Orff levels, and stay tuned to Teaching with Orff for more high-quality lesson plans! I love the left hand strengthening ideas! I am definitely going to start this immediately. I am a flute player and love recorder playing. You gave me a new way of looking at it and I can’t wait to try it. Thank you for your great ideas! Brilliant as always, Ms. Bright! I will be adopting the chicken-bunny-unicorn labels and calisthenics, and the Necklaces of Knowledge, effective immediately. Keep up the amazing work and thank you for sharing! Thanks so much for sharing what you do in your classroom; I really like the left hand dance, I will try that! And it was a great reminder of how you introduce the recorder early on, I do that as well and play it often in all of my classes, and when my little ones are finally in 3rd grade, they are very excited to start! Excellent ideas! Beginning with G and E prevents a lot of problems later on. Love learning from you Kate! Thank you for sharing, my students love your “animal fingers”. Hope you are having a great start to your new year! Great ideas! I can’t wait to start trying some of these things in my own classes! I can’t wait to try some of these things with the little ones. I also love the chicken, bunny and unicorn! Keep sharing! Love your ideas! Thanks fo so many great ideas! I love the chicken, bunny, unicorn. 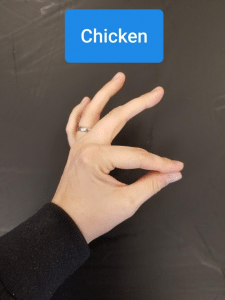 I work at a Montessori school, and I’ve found that the manipulative works they do with pinchers and tongs prepare their fingers for recorder well. (Also holding a pencil.) Activities like transferring small koosh balls, or using tweezers to remove sunflower seeds (which we feed to the birds). Also, to prevent biting, I have the rule “your recorder is not a French fry”. I show them a used recorder with tooth marks, and then mine with none. I also (once) have them try kissing their finger – “see how soft your lips are?” Then biting their finger “see how sharp your teeth are?” Experimenting once early on usually gets the point across. Thanks again. Wow! Such wonderful tips and ideas! I can’t wait to begin our recorder unit! Thank you for your thoughts re: “Benefits” and “Challenges” for each of the ‘first notes’ methods. And the left-hand scarf dance…..priceless! Looking forward to more articles from this brilliant teacher! I will be using these tips! Thank you! Love the scarf dance – a big hit! Chicken Bunny Unicorn very helpful. They really like it, and practiced it between music classes. Kate-you have got me excited to start recorder! Thank you!